Areas we Buy Junk & Not Running Cars for CASH! Scrap Car Prices: Are You Getting The Right Value For Your Junk Car? If you’ve received one or more quotes from junkyards for your unwanted car, you might wonder if you’re getting the best scrap car price possible. Selling an unwanted car to a junkyard doesn’t happen very often to the average consumer, so they have very little experience to rely on when determining the value of their junk car. Unlike the new or used car markets, there are no published prices for junk cars by make, model, year, or condition. Whether you call it “selling a car for junk value” or “automotive recycling,” this really is the final stage of a car. Auto recycling is very literal since some of the metals can find their way into new cars. When you decide it’s time to sell your car for scrap, odds are you’re hoping for a little bit of a payout. But, unlike the price of used cars which only fluctuates a few percent up or down over the year, the amount you can get for your scrap car varies wildly (especially lately). How are scrap car prices determined? Scrap value of a car is intrinsic to the price of metals. Your car stops competing with other cars for dollars. The amount of money you can get is now decided by the current prices of metals from other sources all over the world. And, since metals are commodities, prices go up and down every day, sometimes by huge amounts. Lately, we’ve been in a bit of a scrap metal rut. Actually, since 2012, scrap metal prices have tanked. There was a bit of a short-lived rebound in early 2015, but that ended as quickly as it began. 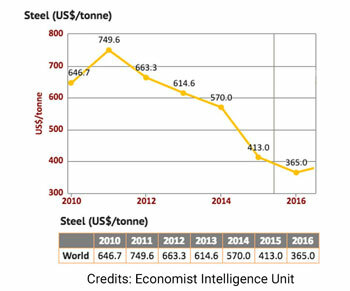 In January 2012, the price of steel was $544 per metric ton. In March 2016 it dropped to $90 per ton. At time of writing, US Shredded Steel Scrap price is $195 per metric ton. Don’t forget, your car isn’t just a hunk of steel. It’s a hunk of other metals, too. In terms of scrap, it’s a similar story for aluminum, copper and iron. That all takes significant time and labor, which cost money for the recycler. Now your $475 of metal is really only worth about $100. Depending on the location and weight of your car, that number can fall even further. Scrap compact cars may only net $50. Why are scrap metal prices so volatile and how do they control junk car buyers? Steel and oil boom or bust together. If you have a damaged, wrecked or broken-down car that’s relatively new, you’re in luck. We buy junk cars online. The value of your car isn’t entirely based on scrap prices. We’ll make you a guaranteed offer for your car that’s based on the year, make, model, mileage, and condition. 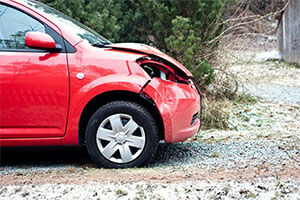 If you have a scrap car, we may still make you an offer for your car. If you just want the car gone, we’re a great option for you. We will pick up your car for free and pay you right there, on the spot. Whatever car you have, just click the button below and get a guaranteed offer for your car, fast.